Krishnagar: The Regional Office of Social Communications (ROSC) Regional Secretaries Meet 2017 was held at Bishop’s House, Krishnagar, 2016 February 2017. The meeting, under the chairmanship of Bishop Joseph Suren Gomes, was attended by the secretaries /delegates from Darjeeling, Badrogand Krishnagar archdiocese, aswell as the Archdiocese of Calcutta. Reports from the dioceses saw healthy growth in communication activities, especially in Darjeeling, where a weekly cable television programme has been started in conjunction with Hathaway cable. Calcutta Archdiocese also saw considerably activity in the past year, notably the media effort for the Cannonisation. Celebrations of Mother Teresa and starting Parish Papers in various parishes. In Krishnagar, efforts for meaningful dialogue with non - Christian intellectuals, is also bearing fruit through the efforts of the dioceses’ Prerona Ministry. The ROSC plans to spread the Good News via a region-wide musical talent contest in three languages, in association with the dioceses who will have diocesan finalist of select performers for the main Regional event; where participants will be groomed by p e r s o n s f r o m t h e m u s i c industry. Suitable prizes and a chance to cut a recording are also planned, said Fr. Prolay Boidya, the Regional Secretary of the ROSC. Kolkata: Just a week after Fatima Parish celebrated couples’ day on 19th February, the Parishioners and Family Cell, under the guidance of Rev. Fr. Mukul Mondal C.Ss.R, Parish Priest, honored the elders of the community on Sunday 26th Feb 2017. Senior Citizens Day.commenced with bilingual Holy Mass at 11 am celebrated by Rev. Fr. Amar C.Ss.R for the Ninety old participants.Nourished by the Holy Eucharist and enlightened by the homily, all proceeded to the Parish Hall. Rev. Fr. Amar C.Ss.R nextpresented the Psycho-social Theory of Development based on the eight stages of life format by the famous psychologist Dr. Eric Erickson. Ably supported by a PPT presentation he journeyed through the age classified stages of life of a human from infancy to old age.The psycho crisis/ strength and environmental influence of each stage were clearly portrayed. The session was much appreciated regarding the reference of the often misunderstood behavioural patterns of persons in a family especially the youth. Dr. Tanvir Reza, an eminent Chest and Sleep Specialist presented an under supported documentary on sleep amnea and respiratory ailments. He explained the situations and health issues offering suggested aides for relief. Rev. Sr. Mary Lobo emphasized the need of prayers in families and all received a card and rosary. She also thanked all present followed by Rev. Fr. Mukul who after prayer invited all to a simple yet hearty lunch.Thereafter, parishioners conducted a game with opportunities to win prizes. The day concluded with tea and snacks. Fr. 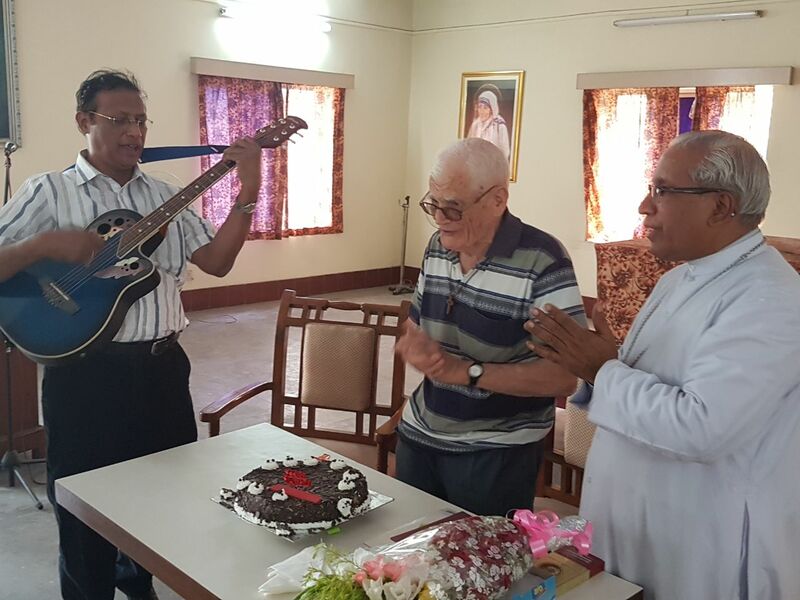 Francis Laborde, once hailed as Howrah’s silent ‘saint of the slums’ turned 90 on 28th February 2017. the Priests’ council members along with Archbishop Thomas D’Souza felicitated Fr. Laborde on his birthday and prayed for his good health and long life. Kolkata: More than thousand Adivasi people from different districts of South Bengal viz. Burdwan, Hooghly, Howrah, Nadia, 24 Parganas, Kolkata had assembled at Samaj Sadan KB Block, Salt Lake on 19.02.2017 by 11.00 A.M. to celebrate “KURUKH BHASA DIWAS” organized by Kurukh Literar y Society of India, Kolkata Chapter. Since ten years almost 50 lakh Oraons observe this day throughout the country. As per scheduled, the procession started in front of Samaj Sadan leading to roads of 14 No. tank towards IC island to South Bidhannagar Police Station Road touching Karunamayee – Beliaghata Main Road. It turned left near 16 No. tank by the roadside of Reserve Bank Quarters to back Samaj Sadan by 1.00 P.M. The participants some carrying posters, placards showing Kurukh language and its use ( Tolong Siki) others were walking & dancing at the beat of Drums, Mandar, Nagera etc. in well disciplined way on about 3 Km road journey. Men, women, youths, and children in their traditional attire attracted the audience didn’t miss to click their mobiles. After returning back people were eager for next programme so there were arrangement of lunch in the form of Khichudi (vegetable mixed rice) and papad was enjoyed and satisfied by the rallyists. At 2-30 P.M. cultural progamme started one by one numbering more than forty groups showed their abilities in group dancing and singing in Kurukh, some mixed with Bengali pronunciation. From some places few santhali groups also joined and performed their customary dances were appreciated byone and all till 6-30 P.M. evening. Darjeeling: The All Christian Minority Central Committee has passed a resolution to stick to the demand for a separate board for the Christian community in the Darjeeling region. The decision comes after West Bengal Chief Minister Mamata Banerjee formed the West Bengal Pahadia Minority Board on February 13 with representatives from Christian, Muslim, Buddhist and other minority communities in the hills such as Bengalis and Marwaris. The notification states that the board will be under the control of the state’s minority affairs and mad-arsa education department. The Christian committee held a meeting on February 21 to discuss the recently declared board. “We have no objection to the board, but we stick to our demand for a separate minority development board for Christians,”Bishop Stephen Lepcha of Darjeeling, who is patron of the central committee, said. Bishop Lepcha also said the committee had made various representations to the state government which did not consult the Christians before finalizing the details of the board. To a question, the bishop said: “More than the benefits, what we fear is that there might be qua rre l (be c aus e of the board).” Father Solomon Subba of the United Christian Minority Organisation, which is not part of the committee, has been made the chairman of the board, while Arif Khan has been made the vice- chair person. Kolkata: Father Felix Raj, SJ, the principal of St. Xavier’s College, Kolkata is the first vice-chancellor of St. Xavier’s University. “As vice-chancellor, my first task will be to form the Governing Board of the university, which will consist of 36 members,” Felix Raj said, adding that he would take over the reins of the Rajarhat University with “immediate effect”. The Governing Board, consisting of 36 members, will include a state government nominee and a UGC representative and will meet for the first time on the University campus on April 28.
become the number one college in India with 3.77 CGPA out of 4. The university will emulate that. It will in no way compromise on quality,” Fr. Felix Raj told the press. Teachers, to be drawn from both India and abroad, will be paid on a par with that of state universities. According to the St. Xavier’s University Kolkata Act, all St. Xavier’s colleges in the state can become constituents of the new institution. “We will initiate the process (of adding colleges as constituents) only after we are properly established, which will take three to five years,”said Felix Raj, who joined the Jesuit Order in Calcutta in 1973 and has been associated with St. Xavier’s College Calcutta since 1984 in various capacities — lecturer, vice-principal, rector and principal. The academic block, a six storied building with provisions to add another six floors, can accommodate 5,000 students in the first phase and is ready. It will house the offices of the VC, registrar, finance officer and the controller till the administrative building is ready.